The apartment is on the ground floor of a two storey attractive stucco building. The entrance to the apartment leads into a spacious well furnished living area with the well equipped and generously proportioned kitchen leading off the lounge area. A utility room is adjoining the kitchen which houses a gas boiler and washing machine The two spacious bedrooms both with en suite bathrooms are accessed off the lounge. There are air conditioning units throughout the apartment and central heating for the winter months. To the rear of the apartment is a large terrace and around the edge a small mature garden. The terrace has a table, chairs and loungers and a BBQ is available. There is a lovely view from the terrace with the 6th fairway in sight and the hotel and clubhouse discreetly visible. To the front of the apartment are mature, well maintained communal gardens. The Campoamor golf estate is one of the best maintained and well run on the Costa Blanca. The Costa Blanca is blessed by generally lovely weather even in the winter months - average highs in the winter months are rarely less than 18 degrees while in the Summer months rarely more than 30 degrees. As a base there are numerous sandy beaches nearby ( the closest within a 5 minute drive) and various towns with amenities to suit all tastes within a half hour drive. Away from the modern developments on the coast there are also many attractive authentically Spanish villages and towns nearby. Besides the golf, tennis and swimming available on the estate there are great water sport facilities at the nearby beaches and lakes and attractive walks and cycle rides which can be started just outside the estate. 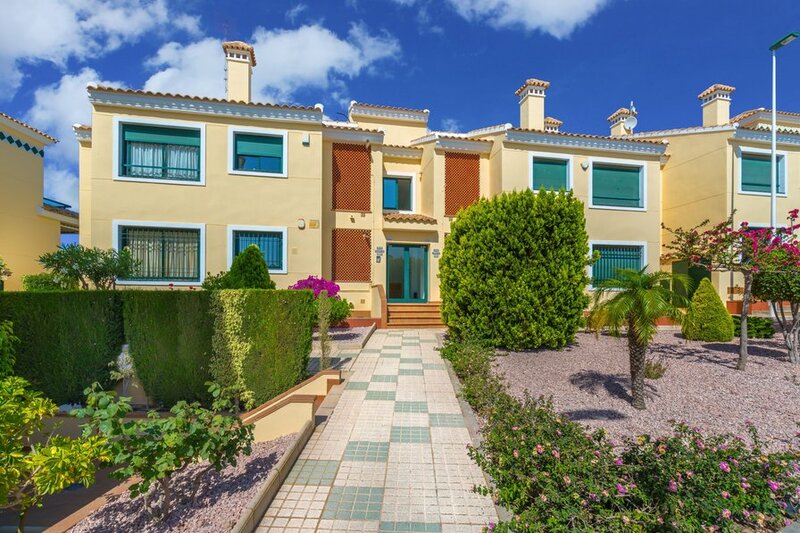 The apartment is situated on the beautiful well maintained Campoamor estate which incorporates the 4 star Hotel Golf Campoamor which has a wonderful terrace bar and excellent restaurant. In addition to the golf course the estate has excellent tennis facilities and access to a serious indoor pool and gym. By car there are access to numerous excellent sandy beaches with safe bathing of the Costa Blanca ( the nearest 5 minutes away) and lakes. Campoamor golf course is a well maintained course with reasonable green fees in a lovely setting that provides challenges to all levels of golfers and there are 3 other courses within a few miles. There are numerous bars, restaurants and shopping facilities adjoining the estate and towns within a half an hour drive which cater to all tastes. There are also some wonderful walks and bicycle routes nearby, some starting near the estate's entrance which give the opportunity to appreciate the extraordinary bird life in this part of Spain.